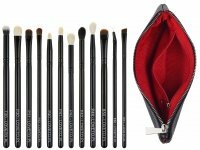 Set of 8 make-up brushes in a case by LOVETO.PL. High quality product. The case was made of a nice to the touch material that perfectly imitates skin. The silver logo of the manufacturer was added on the front, adding delicacy and feminine character. The case was also equipped with a handy lock, allowing easy and quick use. 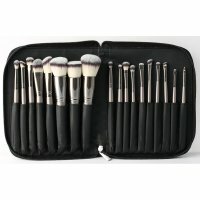 The set contains 8 basic brushes needed for daily make-up. Each of them was made of good quality two-tone synthetic bristles, not irritating even the most sensitive skin. The black, lacquered handle with a silver cap looks elegantly and draws attention. 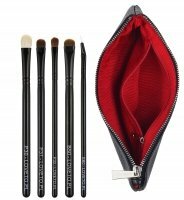 In addition, each brush has a flat-cut handle, which allows it to be placed standing. 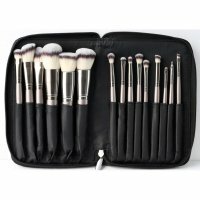 - Large brush for applying powder, bronzer and blush : handle length 13.4 cm, bristles length 3.6 cm, bristles span 3.6 cm. - FLAT TOP brush for applying primer : handle length 13.4 cm , 2.7 cm bristles length, bristles span 3.4 cm. - tongue brush for foundation and concealer : handle length 13.4 cm, bristles length 2.5 cm, bristles span 2,2 cm. - Beveled eyeshadow brush : handle length 15.2 cm, bristles length 1.6 cm, bristles bristles span 1.4 cm. - Brush for applying and grinding shadows : handle length 15.2 cm, bristles length 1.4 cm, bristles span 1.3 cm. - Brush with slightly elongated bristles for application of shadows and spot application of concealer : handle length 15.2 cm, bristles length 1.6 cm, bristles span 1 cm. 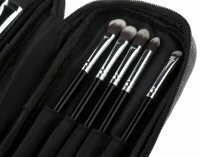 - Small brush for applying shadows in the eyelid fold : handle length 15.2 cm, bristles length 1.5 cm, bristles span 0.7 cm. - Brush for applying eyeshadows and grinding lines : handle length 15.2 cm, bristles length 0.8 cm, bristles span 0.8 cm.